Barbara has written the screenplay ‘The Last Chance Mommas‘, a British ‘Star is Born’ which is under consideration by BBC Films. ‘The Last Chance Mommas’ tells the moving tale of Macy, a Cruise Ship singer who returns the Isle of Wight, where she grew up, called back by the long-lost daughter she gave up for adoption years ago. When her daughter, Sophie, (now pregnant, and unbeknown to Macy, slowly dying of cancer) asks her mother to form an all female band to play at a benefit concert, Macy has to scramble to drag together all her school mates on the Isle of Wight. No easy task! When Sheena, Macy’s long lost mother, an alcoholic ex-Punk star, turns up on the island, Macy’s life gets complicated as she struggles to put on a show for her dying daughter. Her first Musical, Rumpy Pumpy! was funded by Arts Council England in 2015 to play The Kings Head Theatre and Landor Theatre and opened at Windsor Theatre Royal moving onto the Union Theatre Southwark in November 2016, starring Linda Nolan and Louise Jameson. The Kings Head Theatre called Barbara’s Musical “Calendar Girls meets London Road meets Sweet Charity”. Barbara has written the screenplays Mimi and Cowboy Girls, developed by the late Anthony Minghella. Anthony described Barbara’s writing as “bold, highly original and enormous fun.” Barbara is composing and writing Cowboy Girls, as her second musical. Barbara’s first screenplay Mimi was commissioned by the European Media Development Agency. At BBC Birmingham, Barbara co-devised Dangerfield the crime detective series and Dalziel & Pascoe. Barbara was script editor on Rumble (BBC), a comedy-drama series and produced the film Seed (BBC). 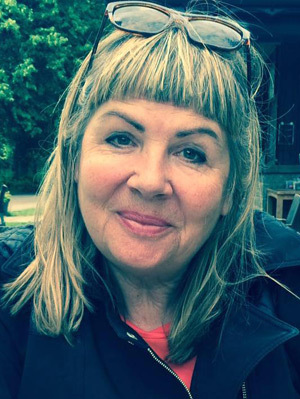 Barbara developed the award-winning film Bad Company (BBC) reopening the case of the Birmingham Four leading to their release. Barbara worked in Drama Development at Kudos, World Productions and Picture Palace Productions and ran her own Production Company, The Bridge, Film & TV Production in Brighton producing documentaries for Channel 5 and BBC South. Barbara’s musical Rumpy Pumpy! - which she wrote and composed - was showcased at The King’s Head Theatre as part of their New Playwrights Season, Without Décor, in April, 2015. 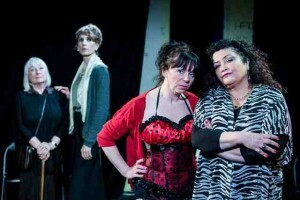 The Kings Head described the show as ”London Road meets Sweet Charity meets Calendar Girls.’ Audiences and critics alike were hugely enthusiastic. ‘Rumpy Pumpy! is being prepared for a UK Tour in 2018 and the feature film is in development. On the Wagon Train, they decide they must dress as male cowhands, ‘Marty’ and ‘Billy’ to get jobs with the Cowboys. 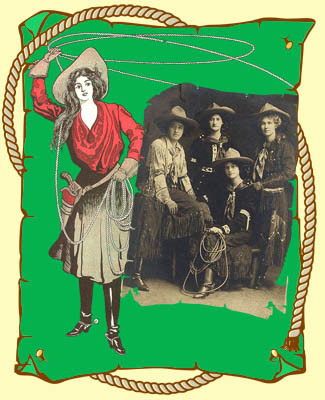 Adelaide, a society heiress, heading West on the trail of her fiancee, Charles, an English Charlatan, joins them and linking up, the three young women become ‘Cowboy Girls’, and then Rodeo Riders experiencing adventures they could only have dreamed of in their former lives. Adelaide falls in love with Maeve, telling her the West is a place women can cast off the shackles of their lives and live in a different way as they search for the freedom they never had before. Barbara’s Musical Arranger will be her collaborator, Steve Parker, an experienced pianist, composer and arranger. Barbara’s support team and mentors include Lisa Goldman, Script Consultant. A classic tale of optimism and hope versus life’s often ungenerous reality, the novel picks up the story of wife and mother – and wannabe writer – Alpha O’ Mara, and takes its reader on a well paced, humorous and romantic journey of ex-pat discovery from Brighton beach to the beautiful Charente region of Western France. ‘Eat the View’ is warm, uplifting literary Chick-Lit, perfect for holiday or bedtime. Barbara Jane Mackie has created a witty, Anglo-French entertainment to tickle the soul!’ Andrew Lucas, Best-selling Kindle Author of ‘Cross Dressed to Kill. ‘A riotous romp in the rolling hills of France, combining the best of British humour with French farce and real emotional poignancy, ‘Eat the View’ is impossible to put down.’ Dr. Craig Batty, Senior Lecturer in Creative & Professional Writing, RMIT University, Melbourne.